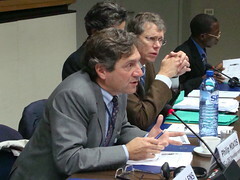 Brussels, 16 October 2008: Speaking to participants at the 7th Brussels Briefing on rising food prices, Philip Mikos, Head of the Environment, Food Security, and Rural Development Unit of the European Commission’s DG Development set out the main ways that the Commission is responding to the food price crisis. The first of the two documents elaborates on the causes and impacts of the crisis and it sets out different responses. Short term development actions focus on humanitarian responses; the medium term on safety nets; the longer term on revitalising agricultural production. The aims are to reduce the negative effects of food price increases on the poorest consumers in developing countries while also encouraging “positive supply responses” from farmers. The second of the documents outlines a new 1 Billion Euro ‘food facility’ – and is still going through the EU’s comitology processes, such as in the European Parliament. Mr. Mikos described this as an instrument to address some of the ‘short to medium’ term challenges not well-addressed in other instruments. The aim is to provide rapid and direct responses to increasing food prices in developing countries. It will sit somewhere between emergency and longer term development instruments, it is for two years only (2009 and 2010), and it wil encourage ‘positive supply responses’ by the agricultural sector (access to inputs and services) andprovide ‘safety net measures’. Aside from this recent headline-grabbing proposal, what else has the Commission been doing? Mr. Mikos outlined three main instruments in addition to the planned food facility. The first is humanitarian assistance through which the Commission is providing funds for food assistance (EUR 232 million in 2008). The second is the Food Security Thematic Programme (FSTP) through which the Commission has allocated some EURO 50 million to 12 countries to support safety nets, social transfers, and agricultural production measures. The third is the European Development Fund through which EUR 200 million has been provided to 30 highly vulnerable countries hit by food price increases.